Setting sail on a Cairns based liveaboard tour bound for Osprey Reef, you will truly be entering a remote unspoilt underwater wilderness, full of vibrant colours, curious sea creatures and stunning scenery. The reef is situated over 60 kilometres from any other, ensuring a remoteness that will leave you with the feeling that you are on the edge of the world. It lies a whopping 350 kilometres from the city of Cairns in Queensland in the Coral Sea section of the Great Barrier Reef, and due to this isolated position it is only accessible via liveaboard. Osprey Reef is famous for it's superb visibility (often over 40 metres) and big fish residents, in particular the sheer number of sharks at North Horn. This site is perhaps the most well known at Osprey, but there are a number of other exciting areas, and when diving Osprey Reef on a liveaboard it's likely you'll also be exploring what Fairy Grotto, Admiralty Anchor and False Entrance also have to offer. Excited by big fish? In awe of bright, natural and vivid colours? You're in the right place! A liveaboard dive tour to Osprey Reef will spoil you with the variety and numbers of large creatures in the water, all gliding through a scene filled with a blissful array of hard and soft corals. The reefs are healthy, of all shapes, sizes and colours you can care toimagine. Divers regularly encounter large amounts of graceful pelagics, and elegant Green and Loggerhead Turtles. There's an extraordinary plethora of life here all year round, but if you are diving here between June and November, you may come across the odd Humpback Whale aswell! Gaze at the many sharks passing by, whilst swimming through large schools of Barracuda or Giant Trevally at Admiralty Anchor. Move onto False Entrance where again you'll join huge schools of fish, this time including big eye Trevally - and if you're diving in the Australian winter you may be lucky enough to catch a glimpse of the peculiar looking Hammerhead shark. Your liveaboard trip to Osprey Reef will undoubtedly include North Horn, the site of probably Australia's most famous shark feed, where Grey Reefs, Silkys, Silvertips and Hammerheads all converge to make a spectacle that will last long in the memory of any diver. Because of it's remoteness, Osprey Reef is difficult to get to, and as a result makes the diving even more spectacular as you'll be sharing the water with very few, other than the stunning marine life on show. The only realistic way to dive here is via a Cairns based liveaboard. 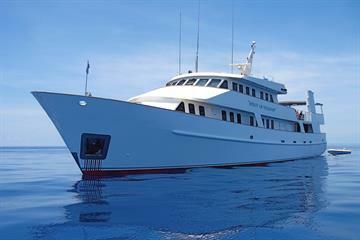 Many of these Australian liveaboard trips are between 4 and 7 days, giving you enough time to sail, dive, and relax. 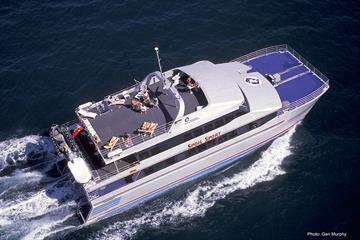 Cairns is a popular tourist town in the North East corner of Queensland, and is the most common port for departing liveaboard diving cruises to the Coral Sea. It has an airport close to town, which is a large international hub and is served by many well known international carriers. It's very likely that you'll be able to fly directly into Cairns from overseas (unless you want to combine other areas of Australia into your trip). If in the unlikely event this is not possible, there are daily domestic flights to Cairns from the even larger cities of Brisbane, Sydney and Melbourne. The vast majority of liveaboard operators will offer a complimentary pick up service from your accommodation. So much going on. Tons of different fish. Definitely an awesome spot for scuba diving. The water is so clear there! It changes every thing for the view on the landscape and the fauna. Beyond excellent. Truly a special spot. Incredible dive location, nothing like it. Probably the nicest bit of the Coral Sea. Lots of sharks, eagle rays, marine life. Osprey was my favourite location from the trip for diving, it is home to lots of reef and grey tip sharks, diving is an exhilarating experience. Great, warm 30°c water means you only need to wear t-shirt and shorts, no need for a wet suit if you don't want to wear them. At all dive sites, we were the only dive group and the vast majority of the time you and your buddy do not bump into anyone else during the dives. Osprey Reef was amazing.we saw a whale shark, what an experience to be in the water with this majestic animal. There were lots of sharks and this was also an incredible experience. We dived with schools of fish including blue bump head parrotfish, barracuda, to name a few.